You can’t go shopping for an embroidery machine thinking that only a specific brand is good. Many manufacturers out there create and make high quality embroidery machine. Obviously, when it comes to actually deciding what the best embroidery machine out there is, there is no specific name. As it’s difficult to settle just for one. It’s very important to know why you buy the embroidery machine. It’s one thing to get it for your own home, to embellish some pillowcases from time to time, and a totally kind of thing to get one for your ambitious and prosper business. Either you get the embroidery machine for a beginner, either for an experienced seamstress; any embroidery machine should present the basic functions: automatic thread cutting, pressure sensor or needle threader, bobbin winding from the needle. Along with these features, you should look for what matters most to you. A larger throat, for instance, gives you more room to move around and lets you use larger hoops. This is a great machine for quilting and not for making a hat. The hoop size on your embroidery machine may count a lot for you and it’s something to consider when shopping. 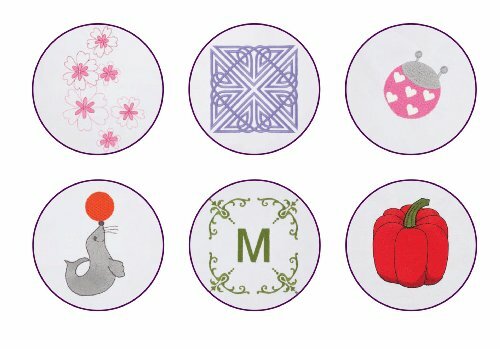 Take a look at the accessories on your embroidery machine; a quilting table, some attachments for special techniques may have a big say on the use of the machine for your special needs. 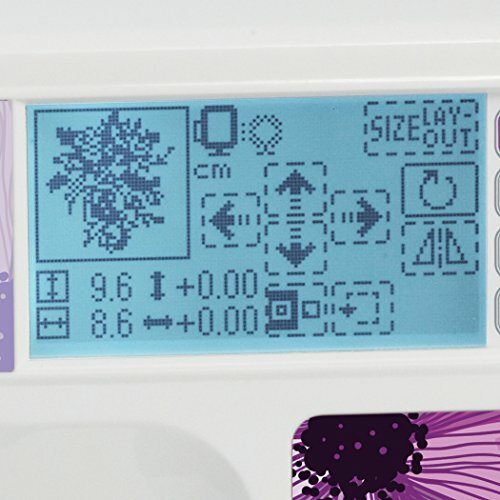 Many embroidery machines come with designs built into the memory, but you get more designs if it connects to a computer or it loads files from a thumb drive. Additionally, you may want to digitize, customize and create your own embroidery ideas. All things considered, you can choose from many embroidery machines out there and knowing your needs, budget and expectations is the first step to a good deal. 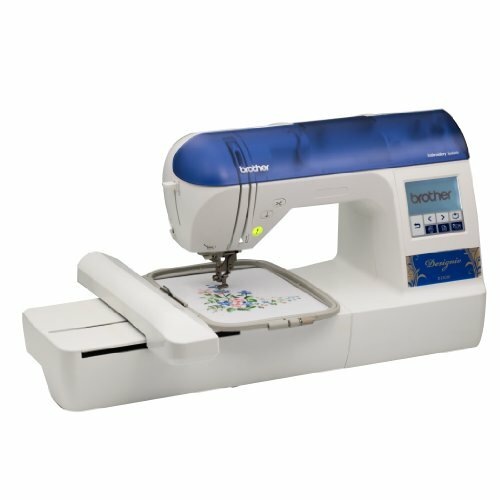 If you want to invest once and get a sewing machine that also does embroidery, give it a go with the Brother SE400 Combination Computerized Sewing and 4×4 Embroidery Machine. The machine has plenty of features that recommend it as a good option for both sewing and embroidering. 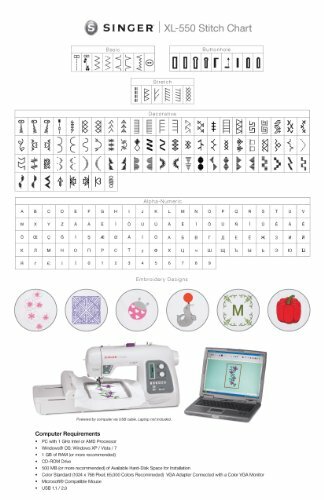 You can choose from 70 built-in embroidery designs, 120 frame pattern combinations and no less than 67 built-in sewing stitches. 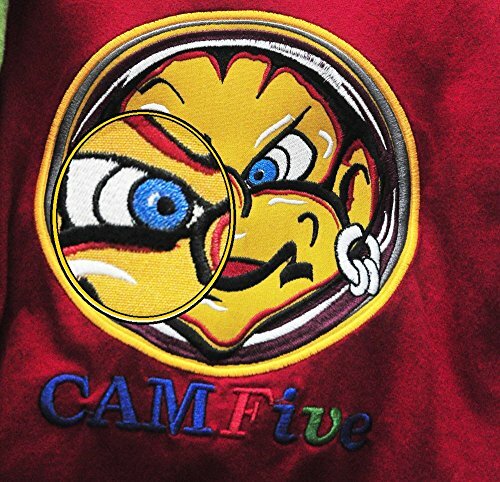 In addition, to increase the options on embroidery jobs, you can also use some of the 5 embroidery-lettering fonts. The embroidery surface is 4”x4”, which is ok for the home use. 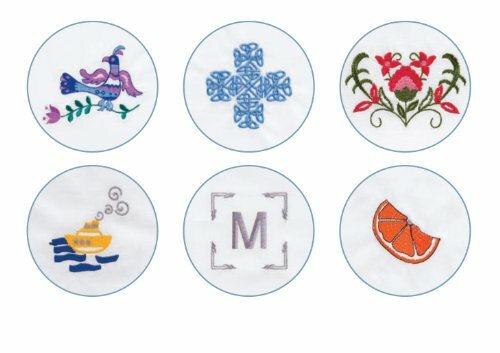 As you may connect the machine to your computer, the machine gives you the chance to easily import/digitize new embroidery designs from your computer. The machine presents the basic functions that any embroidery machine should have. 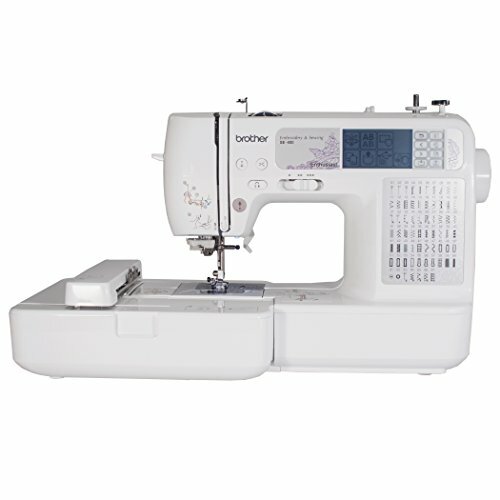 Therefore, it comes with automatic needle threading system, bobbin winding system and Quickset drop-in top bobbin. All these features give you speed on your jobs and a nice, clean finish. The machine features a responsive, backlit LCD display that is user friendly and clear. The risk for jamming is minimal and the machine is easy to use. The English/Spanish operation manual is easy to follow and to apply. Let’s not forget to mention the multiple accessories that come along. The good price, considering the performance may seal the deal for you. The cons aren’t deal breakers for us and we think the machine is a great option as it performs well on both sewing and embroidery jobs. Getting the hang of embroidery it’s a one way street and you can’t go back liking embellishing your garments with some nice embroidery. When you feel you are ready to invest in a dependable, versatile embroidery-only machine, give it a go with the Brother PE770 5×7 inch Embroidery-only machine with built-in memory. The machine comes with multiple features and a large embroidery area (5”x7”), which is quite something for home use. You may create large designs and lettering or both, if that’s your desire. The rehooping doesn’t happen and the machine is reliable. The machine comes with 136 built-in embroidery designs, 10 frame shapes, 12 border styles and 6 lettering fonts. The designs are various and nice and you may also import new designs as the machine comes with a USB port or memory card. The built-in card slot is of help, whereas the built-in memory of the machine helps you store your favorite designs. As it’s also iBrodery.com compatible, the machine gives you even more possibilities to get new embroidery designs. The backlit LCD touch screen display is fast, clear and user friendly. You may edit your designs in multiple ways and get a preview before stitching them. You may enlarge/minimize the size of your designs, rotate mirror image and so one. The auto thread cutter, the easy threading on top thread and bobbin, the precise thread trimming are important features on any embroidery machine and the machine has it also. The machine is highly portable and has a good build. It doesn’t run loud and it has a long life span. As the minimal issues aren’t deal breakers for us, we consider the machine to be a great asset for anyone dedicated to embroidery. 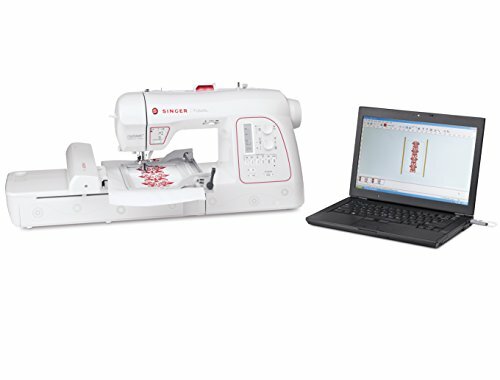 For those of you who like both sewing and embroidery and only want to invest in a good machine, a reliable option is the Singer XL-580 Futura Embroidery and Sewing Machine. The very large embroidery area is a big asset for the machine that lets you work pieces as big as 12”x12”. 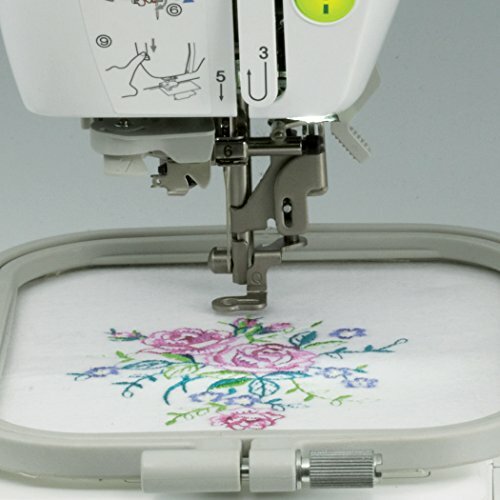 The machine comes with 250 built-in embroidery designs, but also 215 built-in sewing stitches. They all combine so nicely with the 50 endless designs, the endless hoop and the 5 lettering fonts. The machine comes with multi-hooping ability and its hoop is 10”x6” large. You may easily do embroidery on big items like dresses, tablecloths, bedspreads. The machine presents knee-lifter so you may adjust the foot pressure easier, whereas a long arm design is very helpful for quilting or some other larger projects. 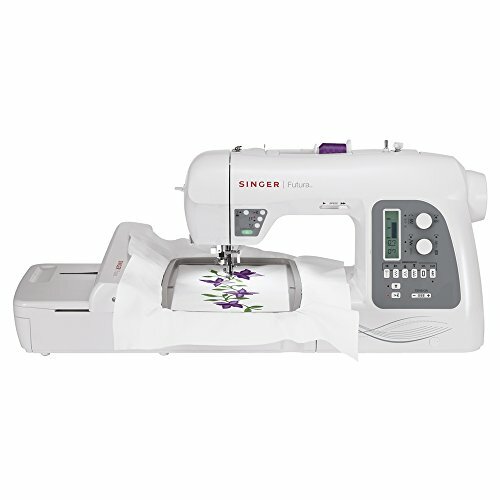 The USB key on the machine helps you edit easier your designs, with no need to be connected to Singer Future embroidery machine. You may use various file types on the machine and the software encourages you to create/scan or edit your images before stitching. The list of basic features tells you about the efficiency of the machine: the electronic thread trimmer, the Independent Bobbin Winding system, the 6 automatic 1-step buttonholes and 1 endless buttonhole. The issues aren’t deal breakers for us and the machine is a great help for both sewing and embroidering. 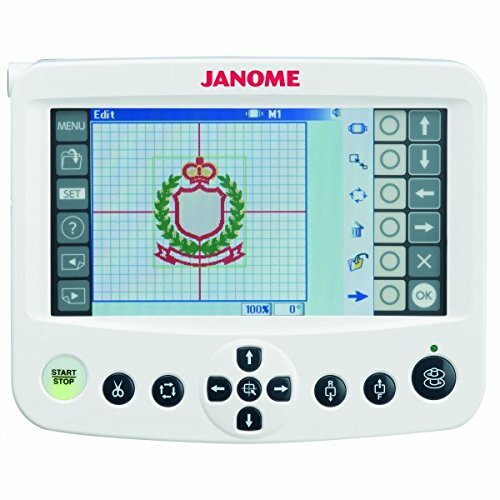 As you are way passed the entry-level embroidery jobs and need a better performant embroidery machine, get to the next level with the Janome Memory Craft 400E Embroidery Machine. The large embroidery surface (7.9”x7.9”) is a big asset of the machine and the wide table for even more work surface is to consider. Of course you need to match the big embroidery area with larger hoops so that you can fully use the machine’s features. 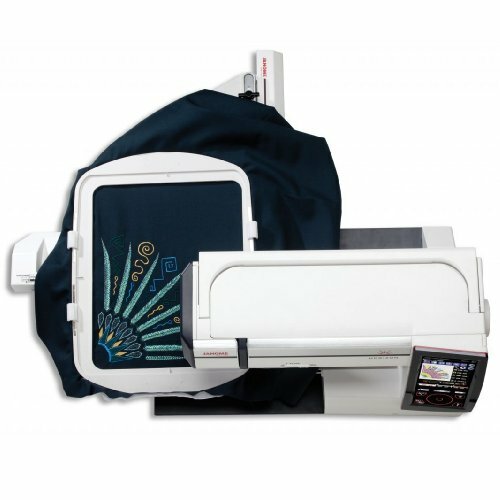 The machine also comes with 160 built-in embroidery designs and 6 monogramming fonts, but you may also import some more designs using the USB port of the machine. In terms of performance, we need to mention the speed and accuracy of the machine. The machine is able to give 860 stitches per minute. A programmable jump thread trimming and the adjustable speed for embroidery are important for the performance. The flexible stitch travels by units of 1, 10 and 100, which is efficient on many jobs. The list of functions doesn’t stop here and we need to mention the direct jump to specific stitch point, the adjustable hoop positioning, the auto return post thread break. The basic functions are also present at the machine: the automatic thread cutter, the built-in advanced needle threader, the bobbin thread sensor. The machine comes with bobbin winding plate with cutter and easy set bobbin. You get to work faster and better thanks to all these features. As for the full color LCD touch screen, we need to say that it’s not only easy to navigate through, but it also gives you the chance to do multiple editing on your designs. You may zoom, group, enlarge/minimize, flip/drag, copy/paste or do corner layout on your designs. Moreover, in case you like it better, you get to so some single color sewing for your designs. The versatility of the machine is important and it doesn’t come only from the various designs, but also from the diversity of threads you may use. The machine is easy to use and supports JEF files also. Despite the downsides, the machine makes it as good, dependable options for embroidering as it comes with much more good things. Either you do it for your home business, or you simply want to step up your game on embroidery jobs, the Janome MB-4S Four-Needle Embroidery Machine is a good example of high quality embroidery machines that can make a difference for your jobs. The four-needle machine comes with plenty of features, which makes it good commercial-grade options. You may start a new embroidery project at the same time another one is still developing. The machine is versatile and you get to use many embroidery formats with the machine and industrial grade one. You may use both four-sized Janome hoops and six industry-level Tajima hoops, thus increases its versatility. The machine comes with 10 monogramming, 2&3 letter, 50 fonts and 3MB memory that store 100 designs, which is around 1,500,000 stitches. The basic features on the machine sure don’t miss the auto thread cutter, the bobbin winding motor. The machine gives nice, accurate stitches and automatically cuts jump threads, between letters just as well. The bobbin winding motor allows you to wind new bobbins in a middle of a job. The stitch counter, the manual thread tension control, the ball bearing precision, the stitch-out time indicator are also important features on the machine. The presser foot sensors are functional just as well. In addition, in case you want to, you may also change the colors when working. The machine allows you great editing options through its RCS feature (Remote Control Screen). There are so many things you can do with the designs: rotate, enlarge/minimize, drag/drop, flip horizontally/vertically. You may edit 65, 536 colors. You may also power other machines with the RCS, which minimizes costs for you. The built-in LED light helps you see better the working area; whereas the Board control sub-control lets you use it without the controller. The backlit LED screen is clear, user-friendly and easy to navigate through. A multi-language selection makes it even more versatile. All in all, you get a dependable, easy to use embroidery machine with plenty of features and built-in designs. Get a reliable and long lasting embroidery machine that is made to take the intense use like the Brother Designio Series DZ820E Embroidery Machine. Not only the machine comes with a great variety of embroidery designs, but it also has a solid body that means a longer life span for the machine. Getting more specific on the machine, we need to highlight it comes with 136 built-in embroidery designs and 6 lettering fonts that give you plenty of options when designing. The 120 frame pattern combinations increase the versatility of the machine and boost your creativity just as well. And, if not all of these aren’t enough, you also get a CD with 200 embroidery designs. 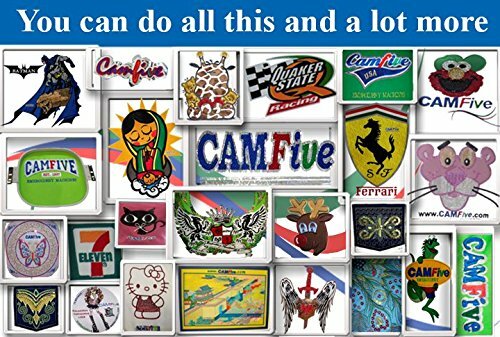 The machine is iBrodery.com compatible so you can choose from more than 5,000 designs. Don’t worry about how to use the machine as it also comes with built-in tutorials that clarify all the misunderstandings. The machine becomes easy to use and so it is the LCD screen. Backlit and responsive, the monochrome LCD display is easy to navigate through and clear. The machine presents the common, yet very important, basic functions: automatic needle threading system, automatic thread trimming, quickset drop-in top bobbin. The low bobbin thread indicator is so helpful also. The risk for the machine to jam is minimal. When it comes to details, the machine is great. The built-in lights, the built-in memory pockets to store your favorite projects, the built-in USB port are just few to mention. The machine comes with a full set of designer accessories and you can find utility for each one of them. You can work a new project as the machine comes with a second set of embroidery hoops, but also find use for the 6 spools of good quality embroidery thread. Nevertheless, for the money you pay, you get a reliable, heavy-duty machine that offers so many great features and designs. 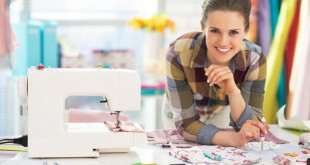 Going shopping for an embroidery machine on a fixed budget is no picnic, but it’s not impossible to find reliable options for a good price. It’s the case of the Brother PE500 4×4 Embroidery Machine that surprises you with its features and abilities. The machine gives you a decent 4”x4” embroidery surface so that you may express your embroidering ideas. It comes with 70 built-in embroidery designs that you may combine with the 5 lettering fonts. The machine is easy to use and you may also connect it to your computer so that you get to import thousands of embroidery designs. 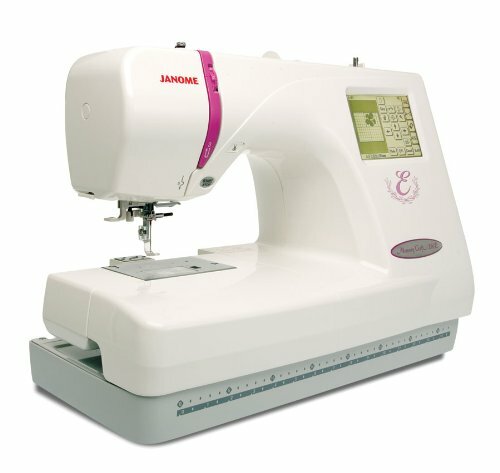 The machine is iBroidery.com compatible, which increases the variety of models you may import. The backlit touch screen LCD display is easy to use, clear and responsive. The automatic needle threader, the easy bobbin preparation are important features of the machine. The quick drop-in bobbin system gives you more speed on your jobs also. The machine comes with a great starter kit that includes several and various accessories. The manual that comes along is bilingual and easy to use. Despite the minimal issues, as it comes with plenty of designs and the ability to import others, the machine is a great spend of your money, as it’s so low priced. 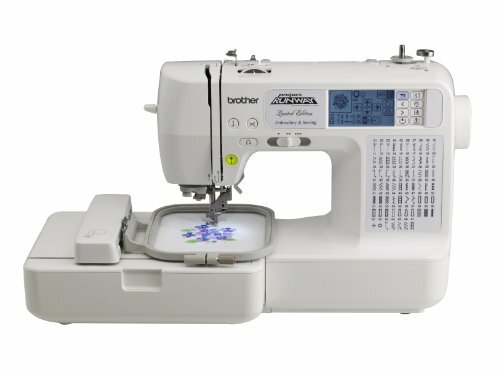 Even if you are an entry level on the embroidering jobs, don’t get intimidated by the multiple features on the Brother LB6800PRW Project Runway Computerized Embroidery and Sewing Machine. 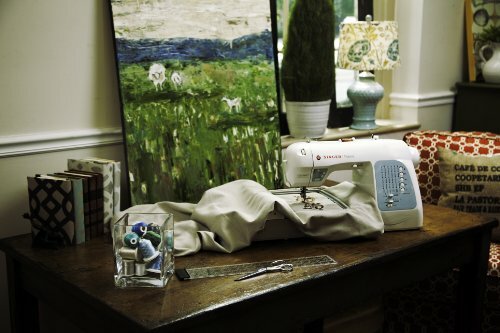 The machine comes with 67 sewing stitches, 70 built-in designs and 120 frame combinations. It also gives you the possibility to use one of the 5 lettering fonts on your embroidering. The machine comes with a 4”x4” hoop and 7 specialty-sewing feet. The one-touch automatic thread cutter cuts instantly top and bobbin thread when in need. the machine comes with several feet and their names sure tell you about when to use each of them: the zipper foot, the button fitting foot, the monogramming foot, the blind stitch foot, the embroidery foot, the overcasting foot. You may connect the machine to you computer as it’s iBrodery.com compatible. This way you import so many embroidery designs from various sites, from PC or Brother Memory card. You need to update the software from time to time. The backlit LCD display is fast, easy to navigate through and to operate. It gives you plenty of editing options (enlarge/minimize size of designs), get a preview of your designs. The USB cable, the protective cover and the designer rolling bag may seal the deal for you. The machine is easy to use and dependable in many jobs. Nevertheless, as it comes with many features, built-in designs, and sewing stitches, the machine is a good tool for any seamstress beginner. Stepping up your level from home to small business when it comes to embroidery jobs is a big moment and you are experienced enough to know the difference between a reliable and non-reliable embroidery machine. 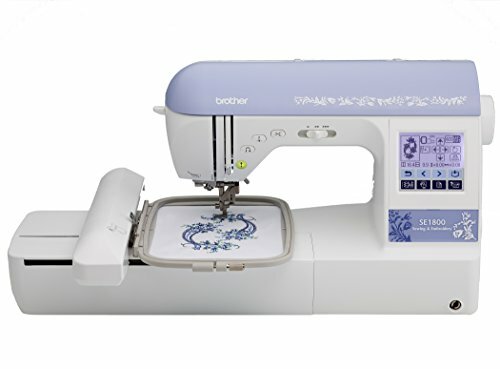 You don’t get to fail though when using a machine like the Brother SE1800 Sewing and Embroidery Machine that makes both sewing and embroidering efficient, fast and nice looking. You can tell right from the beginning the machine is a good buy for your small business as it offers a large embroidery surface (5”x7”) and a 5”x12” multi-position frame. You don’t need to rehoop very often and you may combine the designs pretty easy. 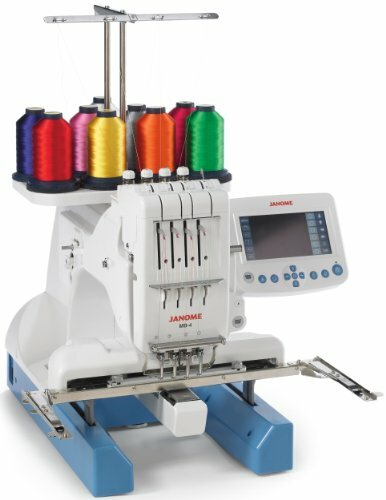 The machine comes with 136 built-in embroidery designs and 6 embroidery-lettering fonts. You can get creative and also use the 12 border styles or the 10 frame shapes. The diversity of the designs is wide, going from floral, to quilt patterns or scrollwork. As the machine is iBroidery.com compatible, you may get more diversity on your embroidery models. The USB stick is also a great chance to import embroidery designs so the options for the variety are great. As the machine is also a sewing tool, it’s important to know it comes with 184 built-in sewing stitches, 100 buttonhole styles and many decorative stitches (shell tuck, drawn work, heirloom, scallops, shell tuck). The My Customer Stitch features allows you to create even more decorative sewing stitches. 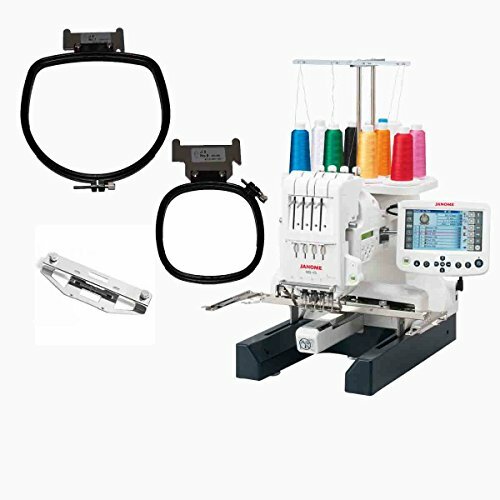 The list of features on the machine includes the basic functions: quickset top load drop-in bobbin, a clear-view bobbin, the automatic needle threader, the free arm (for cuffs and pan legs), the built-in automatic thread cutting button. 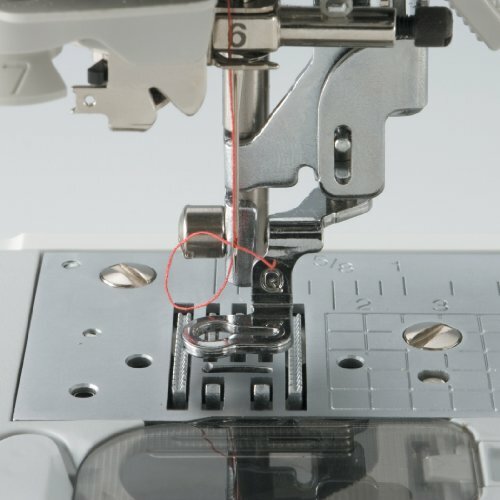 The machine features 11 sewing feet so you may use the precise foot for a specific job. Among the things you get in the solid carrying case, we see the embroidery foot, 4 bobbins, embroidery thread spool. The machine is fast and accurate, with minimal risk for jamming. The multitude of features and styles make the machine a great option for both sewing and embroidering for your small business. Despite the minimal issues, we still recommend the machine as a great asset to any small business. Finding an embroidery machine that also gives great monogramming performance is not that difficult, but it’s not an easy task to find a machine that offers you more options when it comes to monogramming. 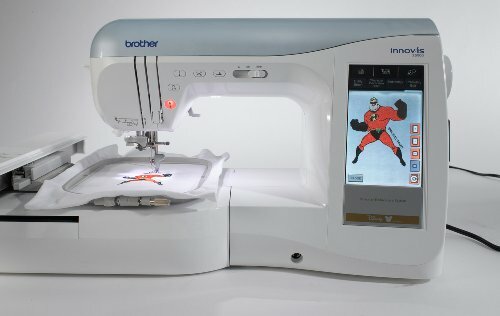 The Brother Innov-is 2500D comes with 160 built-in Disney embroidery designs, but also with 82 built-in patterns, 140 built-in decorative stitches. As for the monograms, the machine lets you choose from 10 built-in monogramming fonts and this is sure a wide variety of styles. The MyCustom Stitch feature also lets you create your own stitches. In addition, let’s not forget you may import some designs using the USB port of the machine. The embroidery surface is quite big with 10”x6”. The machine has a high speed with 800 stitches per minute for embroidery jobs. When it comes to the functional features, we see the typical ones for most embroidery machines out there: thread cutter button, automatic presser foot lifter, advanced needle-threading system, upper/lower bobbin thread sensing system, quickset horizontal bobbin. The machine also comes with automatic upper thread tension system and 7-point feed dogs for easier fabric feeding. The resume function lets you go back to the last stitch you used when turning off the machine. The machine comes with built-in lights so the working areas are well lit. As for the LCD touch screen, apart from being responsive and user friendly, it also gives nice editing options. You may select specific stitches, tutorials, embroidery designs with just a touch. You may also do some layout, scaling, mirror imaging or pattern rotation in 1-degree increments. Despite the minor issues, for it presents so many great features and impressive performance on monogramming, the machine is a great option to consider. 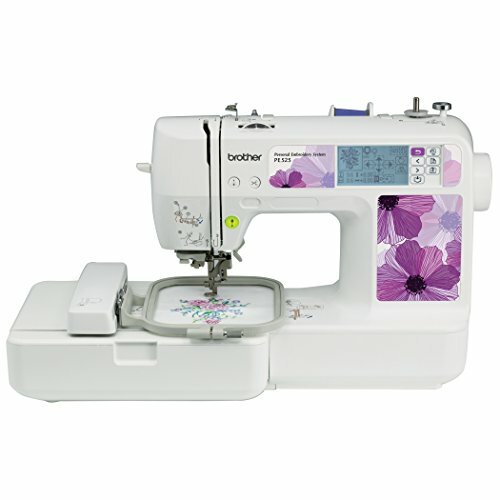 If you want the very best when it comes to computerized machine, give it a try with the Janome Horizon Memory Craft 12000 Embroidery and Sewing Machine, especially if you have the money for it. You may use the machine for both embroidery and sewing. The 15” embossed stainless steel plate in the bed and 11” to the right of the needle sure create a nice space for your working area, the biggest in Janome machines anyway. The machine has great stability and gives you the chance to always create new designs right from the touchscreen. The stitch Composer TM feature encourages you to create embroidery designs right from the scratch. The machine is highly accurate thanks to the AcuFeed system, but it’s also very strong. You may use for your quilting jobs the AcuFeed Flex TM, which is very easy to remove. There are two widths for the system. The multiple feet on the machine gives the machine high versatility and better performance for specific jobs. The adjustable height on the foot is also important to mention. The Auto Pressure and Auto Height make things easier if you want use that is more comfortable. There are many adjustments you can make with the machine and length, width and combining these two is just one of them. The machine comes with 338 built-in embroidery designs, 10 fonts with European characters, 2&3 letter monogramming functions. The embroidery area gets to 9.1”x11.8”. You may use various speeds, up to 1,000 spm. You may also use various embroidery formats: .JEF, .JEF+. The machine connects in real time with your PC due to the Horizon Link feature. As for the sewing part, the machine comes with 425 built-in stitches and are 9mm wide. It has a built-in Memory and you may store your settings. We can also find the basic features on the machine: the built-in needle threader, the automatic thread tension, the free arm, the speed control slider, the start/stop button, the locking stitch button and the twin need guard. The working area is well lit thanks to the 10 LED lamps places in 5 locations on the machine. The machine offers you so many editing options: enlarge/minimize size, zoom, trace, flip, drag&drop, duplicate and use colors of your choosing. Even though it’s so sophisticated, the machine is easy to it. It may not be the first choice for a beginner, but it’s a great investment if you are really into computerized embroidering. If you are already to the point where you do embroidery on hats, it means you really know the business. 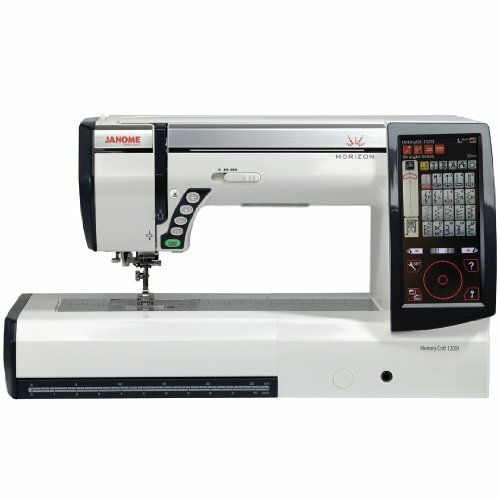 Don’t be surprised by the size of the Singer Futura XL-550 Computerized Sewing and Embroidery Machine, as its large working area actually makes it easy for you to handle a small item like a hat. 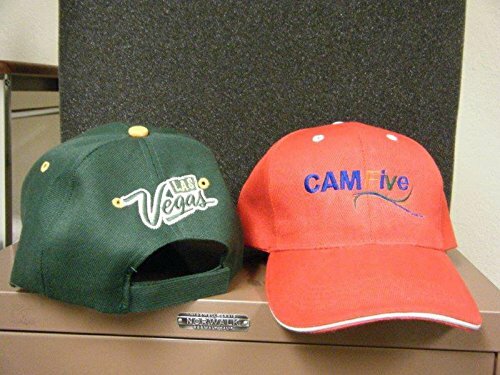 The machine gives a 10”x6” embroidery area and also multi-hooping ability, which makes it versatile and reliable even for embroidery on hats. You may easily work on large projects (bedspreads, tablecloths, dresses) and also smaller items (like hats). 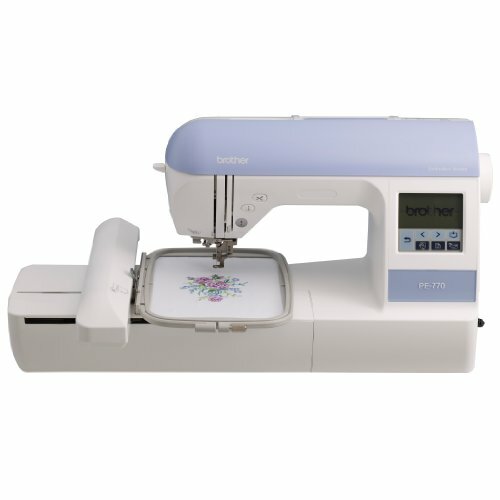 The machine comes with 215 built-in sewing stitches and 125 built-in embroidery designs, 20 fonts and outline lettering. It also includes 6 automatic 1-step buttonholes and 1 endless buttonhole. You may connect the machine to your PC and import via the included USB cable more designs. The machine comes with software and built-in tutorials. 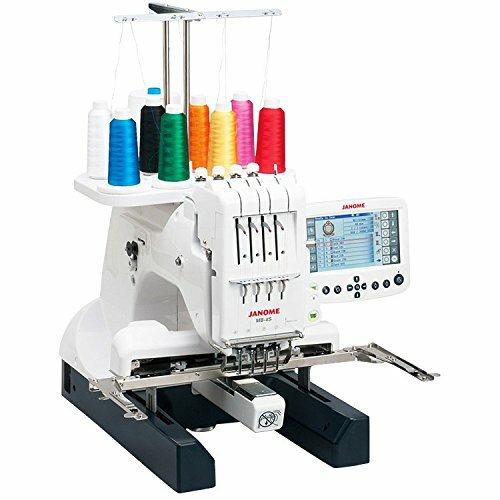 The long-arm machine presents the efficient basic functions also: automatic needle threader, drop&sew bobbin system, the swift smart threading system that gives you speed and efficiency on all jobs. The free arm is so helpful when working on cuffs, sleeves, pant legs. The 6 StayBright LED lights give a nice light over the large working area. The display is easy to read and you may do some basic editing on your designs. The machine is easy to use and impressive with its size and ability to work on smaller items. 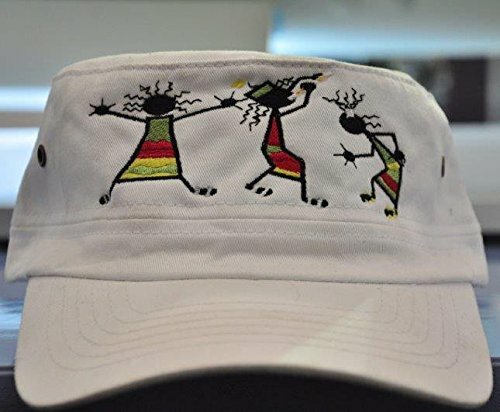 As long as you know the embroidering art, the machine is a big “Yes” anytime, for many jobs, not only for hats. There are many things on the Janome MB-4N 4 Needle that make it a good choice for any small business, and the fact that it’s a 4-needle machine is just one of them. The machine comes with 100 built-in designs, 3 monogramming and 2&3 letter and you can always increase the variety of your embroidery designs due to the very large built-in memory of the machine. The machine is USB memory compatible. You may use most embroidery formats on the machine, including the industry professional types. The machine is also highly versatile and it can work with six industry-standard Japanese hoops and four Janome hoops. The machine is fast and has an 800spm for embroidery. If you we go through the basic features, we see the manual thread tension control, the auto thread cutter, the easy change colors to favorite thread. As for the LCD screen, it’s backlit, easy to navigate through and with various editing options for your designs. You may drag&drop, resize the design 80-120% by 1%, rotate in 1 and 90 degrees increments, flip horizontally/vertically, zoom in/out. You may customize according to your needs the screen and use the multi-language option also. The list of features also includes the stitch-out time indicator, the stitch counter, the ball bearing precisions and the presser foot sensors. The machine is easy to use, even though it comes with so many options. It’s highly versatile and you can also use it for hats, bags or sweatbands. The setup is easy and the machine is portable as it’s lightweight. Apart from its price, we have no comments. Of course, some expected better performance, but this relates also to the one who’s “behind the wheel” ability to use it. 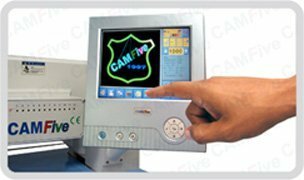 If you are on a hunt for an industrial embroidery machine, you can bet all your money with a machine like the CAMFive CFHS-CT1506 10H. 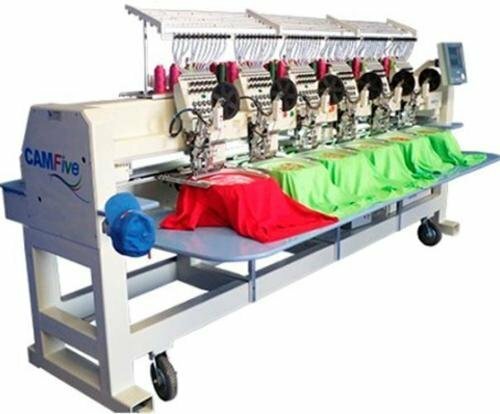 The machine is part of the Computerized Embroidery Machines and performs on both flat surfaces (towels, fabrics, blankets, unassembled clothing pieces) and on jackets, hats, t-shirts or other various garments. You may safely use the machine with other devices for embroider sequins or cording. You don’t need to worry about the power of the machine as it uses ServoPanasonic motor that is not only strong, but also maintenance free and needs low power consumption. The motor runs smooth and reaches a 1,000 spm speed, giving great definition for each stitch. It combines great with the Japanese Koban Rotary hooks that have special joints, for vibrating absorption and minimal noise. The machine not only has a strong build, but also takes the intense use and may run 24 hours a day. The touch screen on the machine features a multi-language control panel and is quite user-friendly. You may group, delete, and modify existing files. The machine supports industry standard .dsz, .dsb, .dst file formats. When we go through the features, we also see the noise reduction system and the “thread” stopper. The machine comes with noise reduction dual internal disk and all heads present thread stopper system. This means the heads that are not embroidering at a moment don’t thread. The automatic thread cutter automatically cuts the thread before and after a color change. You may adjust and calibrate height from the control panel. Every time the machine cuts a thread, a programmable thread collector is activated. In addition, in incase of upper or lower thread break, the break-detection Sensors stop the embroidering at once. You may embroider letters, numbers, names and words with the machine. You simply type in the LCD panel, choose the font/size, special effects and proceed. The 6 heads and the 15 needles on the machine sure recommend it as great option for industrial purposes. Let’s not forget the huge internal memory that lets you store up to 16,000,000 stitches or 1,600 designs on the machine. The list of features also includes thicker/thinner line compensator in panel, the pattern that repeat cyclically, the design preview options, the forward/reverse stitch with adjustable speed option. The password anti-data theft protects your files, whereas the Electronic Monitoring System seeks with the multiple sensors that all components are working right. When it comes to parts we don’t like much, we only need to mention the price. However, if you are in the business you know you need to chip in for an industrial embroidery machine. All things considered, for the multiple features and the long lasting build, the machine is a wise investment anytime. 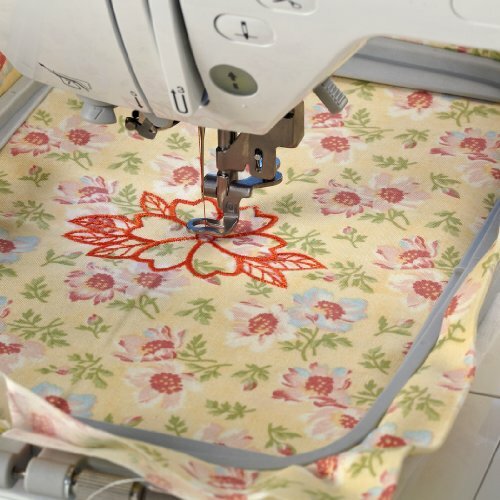 Getting a sewing machine that also does embroidering and offers you large working area for your quilting is not that easy, but also not impossible. 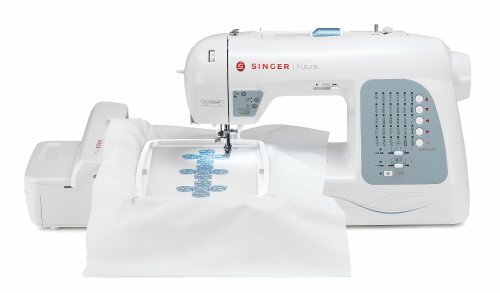 The SINGER Futura XL-400 Computerized Sewing and Embroidery Machine manages to fulfill most of your expectations and to surprise you with its price as well. The machine comes with 125 built-in embroidery designs, five fonts and outline lettering just as well. 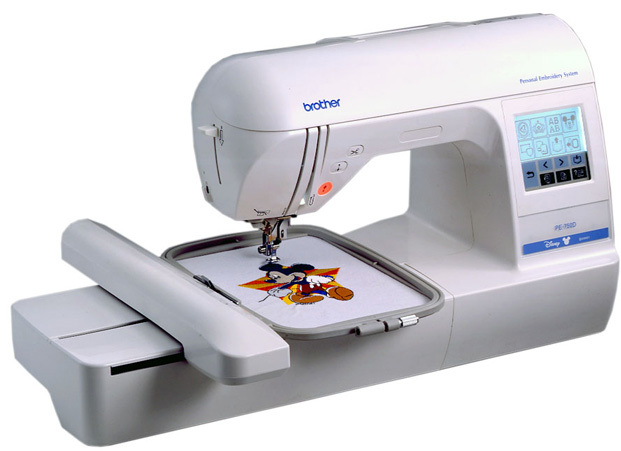 It comes also with 30 built-in sewing stitches and two fully automatic one-step buttonholes. You may create embroidery designs on your PC thanks to machine’s software and then import them to the machine, through the USB cable. The machine supports a great variety of file formats. The machine features an easy-on 10”x6” embroidery hoop with multi-hooping ability. You may have your big projects come to life and make bedspreads, dresses, tablecloths. The list of features contains the SwiftSmart threading system, automatic needle threader. The drop&sew bobbin system lets you load and change the bobbin almost instantly. The six StayBright LED lights give you a well-lit working area for more accuracy and efficiency on any job. The machine is easy to use and the included tutorials are easy to follow. All in all, for an amazing price, you get a dependable, versatile and easy to use sewing and embroidery machine that offers large working area for your quilting just as well. We’re not going to get in the discussion about which machines are best: single or multi needles, we’re going to let you decide on that after getting the single needle embroidery machine Janome Memory Craft Embroidery Machine. The machine comes with plenty of features and gives nice, clean and accurate embroidery every time. The built-in designs are a great start for anyone and you can always import more designs as the machine has a USB memory key compatibility. You get 100 built-in designs, 3 fonts and also monogramming 2&3 letter. 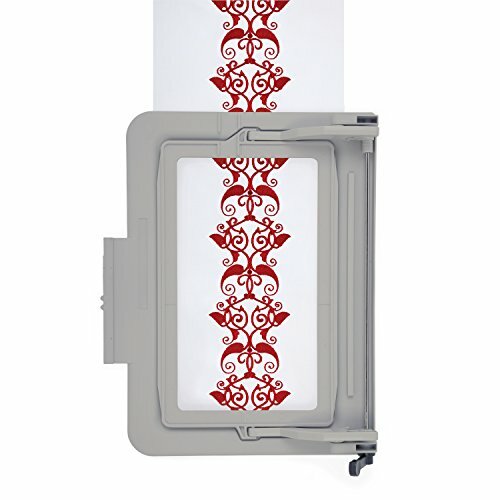 The machine has a large built-in memory so you may import so many other designs. The list of features includes the basic functions: automatic thread cutter for fine accuracy and a speed that can go as high as 650spm. The editing options are various and you may resize your designs (90%-110% by 1%), rotate in 1 and 45 degree increments, drag&drop for easier placement, flip horizontally/vertically, zoom in/out and also change colors to the thread you like. The machine includes also a stitch counter, a stitch-out time indicator and thread presser foot sensors. The manual thread tension control, the ball bearing precision are efficient and the embroidery area is quite large. The backlit LCD screen is clear, easy to use and features multi-language selection. It has nice controls for contrast, designation, in/cm options and much more. The machine comes with standard hoops, 5.5”x7.9” and 5”x4.3”. The Janome’s patented telescopic carriage arm lets the hoop move backwards/forward with impressive flexibility, with no need for external embroidery attachment.